Following a unfulfilling and challenging career in the Automotive Industry, Wendy moved abroad to try a new, more relaxing life. Here Wendy spent time working with animals and assisted with animal rescue, which she enjoyed immensely. However in 2016, after four years abroad, Wendy made the tough decision to return home for financial reasons. After her experience, Wendy decided that she wanted to continue to work with dogs and decided to start her own business as a Mobile Dog Groomer. Wendy approached her bank but was turned down for a loan due to her time abroad, unemployment and that they saw no means for her to repay the loan. 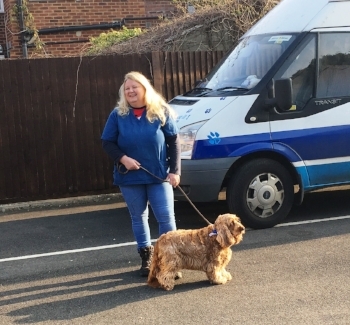 Wendy received the £10,000 loan and was able to pay off her training fees and purchase and fit out a van ready for her first pampered pooch. Wendy also used the loan to create a website and do some marketing. Since the 2016, Furbabies Grooming has gone from strength to strength and Wendy now has a regular Client base which keeps her very busy. Wendy has ambitions to also open a grooming parlour, employ staff and hopefully one day enter the world of dog show competing! For more information, please visit www.furbabiesgrooming.co.uk.